Mother of rapture, Thee we seize! Our eyes or tears now smile in Thee. Thy Power we clasp from thy silence-sea. So near art Thou, O Mother Dawn! In bliss to answer our moon-white call. A world of hush sublime is thy Dream. In Thee alone the golden All. Before Thee quivers the battle of Night. Thy Grace supreme is Nature’s Soul. Thy joy shall flood our triumph’s goal. 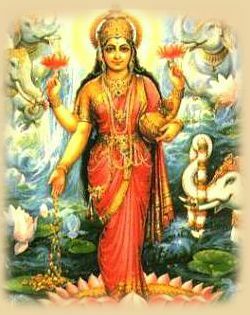 The third goddess or aspect of the Divine Mother is Mahalakshmi. As I told you, “Maha” means great and Lakshmi is an aspect of the Mother representing beauty, charm, sweetness, harmony and peace. These are her main qualities. She is the Mother who works to bring divine harmony into every aspect of life. This mother shows infinite patience at times when Mahakali would not show patience. No tardiness, no sloth, no weakness will Kali tolerate in the devotee. Of course, she is showing boundless compassion when she gives her speed, but she asks her devotees to respond to this compassion. She is ready all the time to offer us her highest blessings and lift us high, higher, highest to the transcendental Consciousness; but we also have to be ready to jump with her, run with her, fly with her. This is what Mother Kali demands. But Mother Lakshmi has infinite patience. She says, “If my children want to go slowly, then they can go slowly and steadily. Unerringly I shall guide them.” This is what Mahalakshmi feels. Mahalakshmi is for all. She is for each individual soul, whether the soul is aspiring or unaspiring. She wants a peaceful harmony, light, beauty, sweetness and splendour in each individual. These are the qualities of the heart, and these Mahalakshmi embodies in infinite measure. Her devotees want to feel their oneness with the world and become the world. Inside the world they want to establish the divine harmony, the divine light. They are ready to wait for this transformation even if it does not take place in this life. But the disciples of Kali have no time to wait; they are not satisfied with just harmony and beauty in their lives. They want only the highest Absolute. They care only for the highest Height. The devotees of Mahalakshmi do not and cannot progress as fast as the devotees of Kali. Excerpt from The Dance Of The Cosmic Gods by Sri Chinmoy.